We’ve been trading since 2009 and you can always expect fast Kratom delivery from our always fresh Kratom stock. You can also purchase Kratom using your credit or debit card securely for quick checkout & dispatch of your orders. 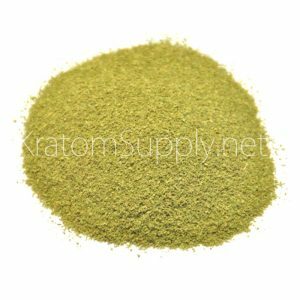 Our extra-fine Green Malay Kratom Leaf Powder from Malaysia is a popular choice and also our best selling strain. It has long been a favourite of many, and we’re sure that you will enjoy this very individual Kratom variety. Our Green Malay Kratom powder provides an excellent all-round aroma with exceptional value for money, and with a fantastic heady scent. This strain of Kratom has a larger and dark green leaf. Originating from the deep jungle and wild harvested from matured trees, it really does provide a uniquely strong aroma. It is favoured by those who prefer a long lasting aroma, which also provides great value for money. Promoting a great sense of well being and comfort, this strain really does deserve its reputation as one of the best out there. Before processing the centre vein and stem have been removed from the Green Malay Kratom leaves. The leaf and vein material has a much higher concentration of 7-Hydroxymitragynine than stem material. The final result is a fine, dark green coloured Kratom powder. It is 100% natural and is sure to become one of your favourites too. All variations of this product are sold inside a foil lined resealable bag to ensure that it reaches you as fresh as the day we receive it. You can be confident that the kratom you order is in stock and ready to ship. Orders completed before 12 midday are shipped on the same day (Mon-Fri). This is my favourite strain due to the potent qualities of it, perfect for day time use, and mixes extremely well with White Sumatra. I only use this company due to the quality of the Kratom products, I have used other companies in the past which were okay, but nowhere near as fast with delivery, good on quality, and value for money. 5 Star ***** product for sure. Ordered Green Malay & White Sumatra at 11am on Tuesday 12th April and had my order at 1:30pm on Wednesday 13th April by regular free post. Astonishing speed as usual, especially at this chaotic time as we await UK laws etc. The quality is the height I remember it. Here’s hoping the UK government see sense for all of us, what next…..ban Coffee or anything that slightly lists under psychoactive! Banning nature is absolute craziness! My fav strain, have tried others, and enjoyed others but always come back to this,uplifting aroma makes the world seem a better place. As for service,it is first class, great packaging,fast delivery, super quick and friendly replies to any questions, a lot of so called “main stream” businesses could learn from these guys! Will be very sad to see them go when the new laws come in! Hope they all have other things to fall back on and best of luck to every one of them! Thank You! My all time favourite strain. Could not fault it. This is the classic green vein kratom. This is the first batch of Kratom I have ever purchased and it seems I made a good call. My order also arrived within 48hrs of ordering, which is impressive! Time to order some more! Excellent product as always with a calming yet uplifting aroma. Can’t reccomend this seller enough, very fast delivery and never once had any problems. A really nice uplifting and mood boosting scent!! My favorite so far. Great day time strain and super fast delivery. Once again thank you for a great service. Im new to Kratom and this was the first website I came across-Im glad that was the case…..cant fault them. Product is packed great and recieved extremly fresh and with such speed of delivery……Excellent service…. Not my type of glow, though i gave this 4 stars for potency. If you are into green strains then this is defo for you. I enjoy my red more and think i will stick to them. Great quality, packaging, customer service but just not for me. Fast delivery top quality product. Tried a sample of this out of curiosity (it being the best selling strain and all) and was very surprised with the result. I had tried Green Malay before but from a different website. It seemed very mild and banal, comparable to a weak Bali. This website seems to be selling a product of very superior quality. The effects are both stimulating and physically pleasurable. Very high quality in unbeatable packaging. Much potent than I expected! I call this “old faithful” – it’s a great all rounder. Upbeat aroma. Brilliant site, too. I wouldn’t buy from anywhere else. Quick delivery, professionally packaged and definitely the finest powders available. Highly recommend Green Malay and KratomSupply. Hello I received it only 3 days ago after I made my order! 2.5 gr was enought to appreciate, I am very surprise of the quality! Bonjour, j’ai recu ma commande seulement 3 jours aprés, rapide est le mot! La qualité des produits est excellente! I have tried a few varieties and Green Malay has by far the best aroma. very good scent with this one. The best kratom on offer, from the best vendor in the UK. If you have not already tried Green Malay, i highly recommend it! Really great site, very helpful staff, quick and reliable service and decently priced quality product. I would recommend this purchase to those looking for their first buy on the site. It has been mine and I am most certainly not disappointed. When the opportunity arises to purchase again I will be returning to this location. Lee. This is by far the best strain in my opinion. No matter how many others i try i keep coming back to Green Malay, awesome stuff. Also, i have tried this strain from many vendors and you will not find any fresher Green Malay than the stuff you can get here. The Queen likes Tetley, God likes Green Malay. A great all round strain providing something a little different from Indonesian and Thai strains hence why it is so popular. Great delivery & well packed. Easy to use site, would definitley use again/recommend.